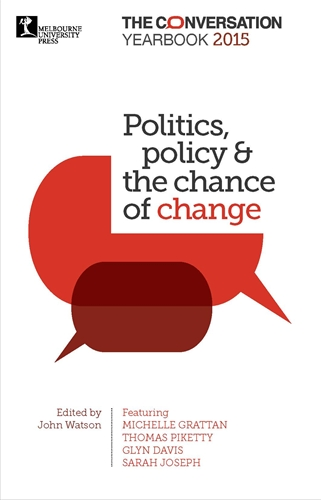 My Cogito article "Why I still support Charlie Hebdo" has been picked up for republication in Politics, Policy & the Chance of Change: The Conversation Yearbook 2015, edited by John Watson and published by Melbourne University Press. In effect this book is a Year's Best (or at least a year's highlights) anthology of material published by the Australian arm of The Conversation. Politics, Policy & the Chance of Change will be available within the new few days, and it will receive well-publicised launch events in a number of Australian cities. I'm told there are about 80 authors overall, but at this stage I don't know who they are beyond the fact that the book's cover says it features Michelle Grattan, Thomas Piketty, Glyn Davis, and Sarah Joseph. As you might expect, I'm pleased and excited to have work in a volume that will gain a high profile in Australia. In all honesty (and with no false modesty), I'm proud of the piece in question - it makes some important points - so I'm pleased that it will now reach a wider audience. My thanks to all involved, not least Tim Dean for inviting me to join the Cogito blog (hosted by The Conversation). Tim's faith in me has been of great benefit to me over the past few years, and it's much appreciated. All the contributions in the book have, of course, already been published online. Tracking them down would not be straightforward, however, so I'm sure it will be well worth the price.